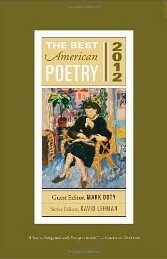 The Best American Poetry: 2012; Guest Editor Mark Doty. Selected Mark Doty as the 2012 guest editor. T.S. Eliot once wrote: "Upon giving the matter a little attention, we perceive that criticism, far from being a simple and orderly field of beneficent activity, from which impostors can be readily ejected, is no better than a Sunday park of contending and contentious orators, who have not even arrived at the articulation of their differences." Marie Howe's "Magdalene — The Seven Devils". For the 2012 issue (guest editor Mark Doty): again the mode returns to an earlier decade: the 1950s. Omits date for three DTS poets (declined-to-state birth year): Steve Heighton, Brenda Hillman, and Rick Bardot. [omits 3 DTS] 2011 issue. 2010 issue. 2009 issue. 2008 issue. 2007 issue. 2006 issue. 1995 issue. Copyright © 2012-2015 by J. Zimmerman, except for quotations.